Well I've taken a little while to write this post as I wasn't sure really what to say, I've been filled with the green eyed mummy guilt monster. As a child I suffered from eye problems and my parents made the decision for me to undertake operations to correct my eyes after patches and glasses failed to help. Ruby attended an eye appointment before starting school at the age of 4, we were told all was ok however I was very shocked to discover at her recent eye test at a different opticians that she was showing signs of a problem, the optician asked when her last test was and he was shocked that it wasn't that long ago and horrified that her problem had not been picked up previously. Over the last few weeks I've been a little concerned about Lotties eye sight as I have noticed a slight turn in her eye when she becomes tired, with my history I was taking no chances so she was taken for an eye test at the same time as Ruby. Undertaking an eye test on a 2 year old is not an easy task but the opticians were brilliant, they showed Lottie various different black silhouettes on a white background eg: a train, a dog or a chicken. The images got bigger and the optician was able to shine a light into her eye whilst she focused on the images. He placed a pair of glasses on Lottie and started to alter the lenses and repeated the previous task with the images. Well the conclusion of the eye test for both girls, they both need glasses! Initially I cried, I was horrified that my girls would have to wear glasses, I felt guilty that it was my genes that had caused the problems with their eyes. It's taken me a good week to get my head around it but it's not too bad. When it came to picking glasses for the girls it was very easy to pick for Lottie it had to be a pair of Peppa Pig glasses as I knew it would be the only way she would wear them! Ruby's on the other hand were harder to pick as her's were more based on style than brand, eventually we settled on a red pair with butterflies on the sides. 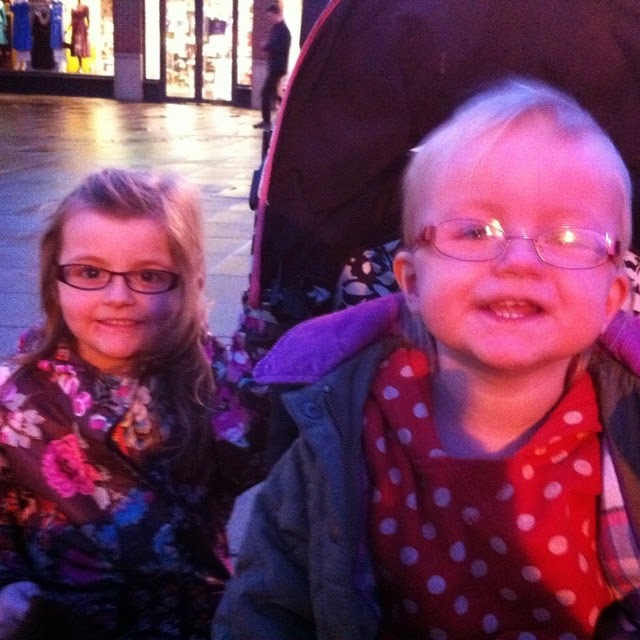 The girls picked up their completed glasses today, I posted a photo on social media and I was greeted by lovely comments from people about how beautiful my girls looked, I was so wary of posting the photos but I feel more reassured so I hope my girls attend play school and school feeling confident in their new glasses too. At the end of the day they are still my princesses with or without glasses, I love them both so very much. I really like this glasses..